Our wrought iron fences are built to last, yet give your home a very elegant appearance. If you are considering having a wrought iron fence installed for your private property, the Northern Fence wrought iron fence professionals are here to help! Wrought iron fencing is a great choice of fencing as it provides an old style, classy look all while enclosing outdoor features such as a pool or garden. In addition, wrought iron fences can keep pets safely contained in your backyard, so please reach out to us today for assistance on wrought iron fence installation! Wrought iron fences, though a high-end choice, are expensive. However, the benefits of owning a wrought iron fence far exceed the negatives. The strength of the fence means that there is much less maintenance required when compared to other fencing options. 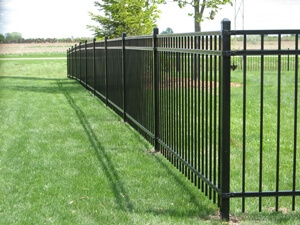 As a result, an wrought iron fence installation is an excellent choice because of the fence’s long-lasting quality. In addition, some of the fence’s pricing is offset by the now raised property value upon installation. Wrought iron fencing provides various heights, being able to suit your needs. Wrought iron fencing offers many panel styles to choose from, including Arrow, Athena, Concord, Sonoma, and Telluride. Wrought iron fencing features a gate design unique to the fence style chosen. If at any point you find you need a wrought iron fence repair, please feel free to give the Northern Fence team a call! We will discuss with you the available options for your wrought iron fence repair. Wrought iron fences are unmatched when it comes to durability and aesthetics, and Northern Fence can help you assess your wrought iron fence replacement. If you are looking for wrought iron fence replacement for your wrought iron fence, please give us a call! The Northern Fence professionals can work to find the wrought iron fencing that is just right for you. Best of all, our estimates for wrought iron fences are FREE!